Facebook Inc. Chief Executive Officer Mark Zuckerberg is betting the company’s future on video and disappearing posts called "stories," not the company’s famous news feed. Investors are buying into the vision for now. Facebook shares rose 3.9 per cent in pre-market trading, after closing at US$146.22 in New York. Earlier this year, the company said revenue growth rates would decline in the third and fourth quarters, sending shares plummeting. That set a low bar for Tuesday’s results. The company’s flagship social network has almost reached saturation point in terms of its growth, especially in the U.S. and Europe. And new Facebook users often live in less-lucrative advertising markets. That’s left company spending heavily on more experimental projects. Future revenue growth depends on Facebook’s ability to shift marketers’ interest to new ads in messaging services, and marketing spots embedded in a popular way of sharing called "stories," especially on Instagram. In those formats, users post videos about their day that disappear within 24 hours. Users tap through them and see ads in between. Third-quarter revenue jumped 33 per cent, while profit was US$1.76 a share, well ahead of Wall Street projections, according to data compiled by Bloomberg. Monthly active users totaled 2.27 billion, up 10 per cent from a year earlier. "Facebook grew revenue at a nice pace in the important U.S. and Canada markets," EMarketer analyst Debra Aho Williamson said. "Facebook also managed to eke out a small usage gain in the U.S. and Canada. After the flatness we saw last quarter, that’s a good sign." The earnings report comes a week before an even bigger test for the company: The U.S. midterm elections. Facebook’s executives have touted their commitment to avoid the missteps of the 2016 election, when Russia ran a misinformation campaign that disrupted U.S. politics. Facebook has been investing in safety and security, hiring thousands to monitor user complaints and investigate unusual activity, while improving its technology to take down fake accounts and pages. 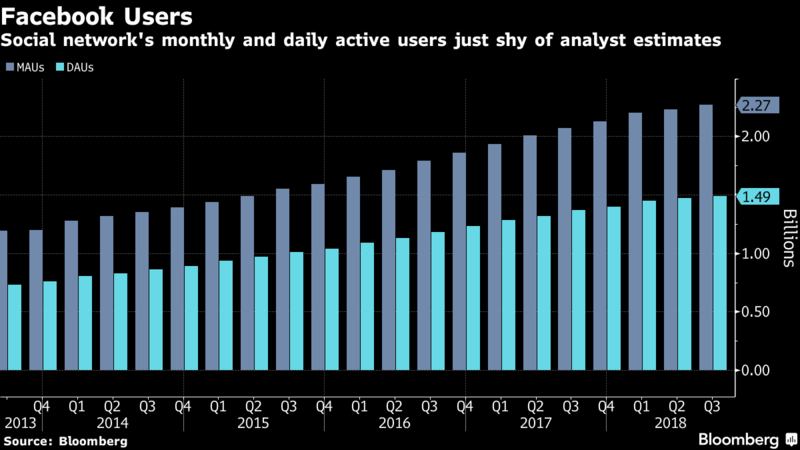 "2019 is a make-or-break year, as revenue growth will accelerate if Facebook can execute,” Jitendra Waral, an analyst at Bloomberg Intelligence, wrote in a note to clients.